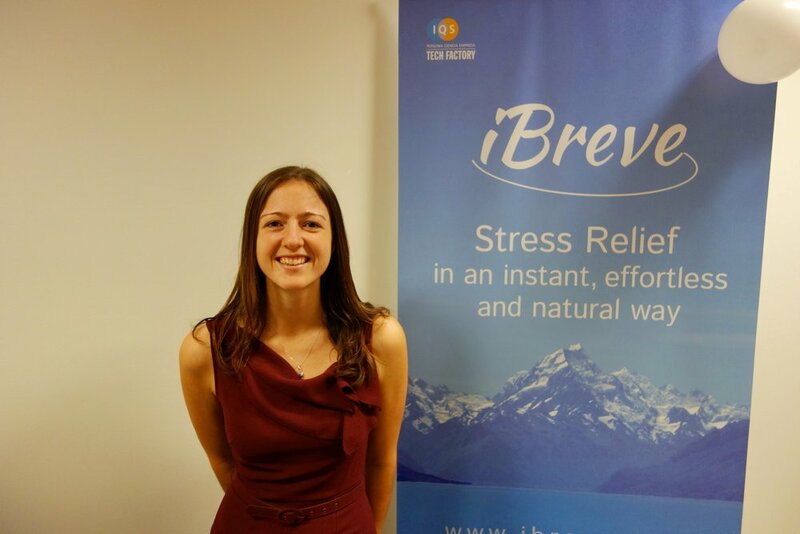 Flavia Wahl is the founder & CEO of iBreve Ltd, an early stage wearable startup founded by 2 former Google employees aiming to create a world free of stress related diseases. Flavia has 7 years of work experience in the IT industry. At Google in Dublin and Boston she worked in the Legal Department as a Product Lead for Google Image Search and as Language Lead for Germany for data privacy & copyright. She also has experience in business development (Google GSuite for Business) and during her studies she was the Local Committee President of AIESEC e.V. Tübingen. She is holding a Master's degree in Business Administration from the Eberhard Karls University of Tübingen. What is the idea behind iBreve and how did you come up with it? We are all exposed to many stressful situations in our modern day lives. Work, deadlines, family obligations. Though small doses of stress are good, too much stress is unhealthy and can lead to serious health problems. What if I would tell you that we all have a perfect stress management tool already integrated in our bodies? We only need to use it properly. It is called ‘breathing’ - the only part of the autonomic nervous system that humans can actively control and if used correctly, directly sends us into the ‘rest & digest’ relaxation mode. At iBreve we show you how you can leverage this tool and breathe ‘smarter’. We developed a wearable that helps people to cope with stress by analyzing breathing patterns in real time. It prevents stress by detecting shallow breathing, guides through relaxation exercises & its machine learning algorithm optimizes your stress resilience long-term. iBreve focuses initially on women's health & well-being. We designed our wearable so it can be easily & discreetly attached to any regular bra, which offers a perfect position to measure breathing through chest expansion. Gentlemen, no worries we will also take care of you: iBreve4men attached to the belt-line is planned for 2019. I guess it all started on a trip around the world. My cofounder and I spent a month in Rishikesh, the yoga capital of the world, set on the foothills of the Himalayas in northern India. We were fascinated how ancient breathing knowledge is integrated into people’s daily lives, especially compared to our western world. Inspired by this experience, we embarked on a mission to combine ancient breathing knowledge of eastern cultures with new sensor technology. Back home, we build the first proof of concept prototype, attended the Mobile World Congress and successfully participated in hardware acceleration programs. Today, we are an international team of five, combining experiences from Google, quantum physics & machine learning. Together with our design partner Zinc in Barcelona, we are designing a beautiful wearable and creating an amazing user experience - specifically tailored to women. Although health & fitness wearables are very popular among consumers, there are a number of concerns about accuracy & reliability of using consumer wearables for preventative healthcare. iBreve became part of the Health Chapter of the European Institute for Innovation & Technology (EIT) to gain access to expertise from health care professionals and build iBreve upon scientifically proven evidence. One of our first steps towards preventative healthcare is initiating a ‘Smarter Breathing’ campaign on our social media channels to create more public awareness on the importance of breathing to cope with stress (https://www.facebook.com/SmarterBreathing, #SmarterBreathing). We tested the iBreve prototype at the Global Yoga Congress in May and analyzed the breathing patterns of over 40 women. It was fascinating to see that we were able to distinguish between yoga beginners & experienced yogis only by looking at the breathing curve. Further, iBreve received a subgrant from the EU-wide research and innovation initiative WEAR Sustain for our dedication to sustainability & user-centered design. WEAR Sustain supports disruptive technologies with interdisciplinary collaborations between technology companies with designers & technologists. It is managed by a consortium of 7 organisations across 5 EU countries, including universities and research centres. As an entrepreneur you encounter many challenges, pretty much on a daily basis. Having a clear vision and building a great team is super important to overcome these challenges. In the tech world you still run into more men than women. You can imagine, the amusing conversations I have explaining a female focused product that is attached to the bra to male investors. On my path I met a lot of amazing people that supported me. I think diversity is one of the most important things in life. Working together with people from different backgrounds and with different experiences is productive, fun and insightful. Inspiring more girls & women to join the tech world is going to contribute to this diversity and benefits society with better answers to current challenges. Follow your dreams & do what you are passionate about. Surround yourself with a supportive network that empowers you & helps you to grow. You are full of great ideas and thoughts, so make sure you voice your opinion. There is an exciting trend for consumer wearables to move into healthcare and become medically certified digital health solutions. But I don’t see it as a one-way street. At the same time medical devices are becoming more user-friendly and connected. The future for both lies within the focus on prevention. To ensure our health systems are future proof, we need an urgent shift towards prevention, instead of mere disease treatment. Exciting is also that more and more wearable makers and also the fashion tech industry recognize the importance to develop products on the basis of sustainability principles. Be it in the field of natural & preventative health solutions, working with recyclable materials or wearables with a sustainable impact on society as a whole. My 3 most inspirational women are Limor "Ladyada" Fried - founder of Adafruit - for enabling anyone to build cool stuff; Dr. Ciara Clancy - CEO of Beats Medical - for being a passionate entrepreneur who has a wonderful way of sharing her experiences, and Adriene Mishler - from Yoga with Adriene - for helping me start my day with a good dose of yoga & full of positive energy.